Scattered around the village we will have outlines of ‘Tommys’ (ordinary soldiers) who are with us in spirit, having fought for us, and yet they are not with us because their bodies were not returned home. At the Peace and Reconciliation Memorial we will have silhouettes of soldiers who when the whistle sounded went up out of their trenches. We will have, sitting on the bench there, a Poppy Soldier and we invite people to put poppies into the chicken wire to remember those who fought so valiantly. John Reid is making the silhouette of a tank – to signify the technological advances made in the first World War. On the lamp-posts we will have large sponsored poppies. 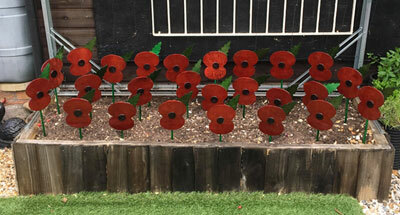 The Community Hall and United Reform Church Hall will have Poppy displays made by our Youth club and Scouts. At the church we have our Community cascade of Poppies, at the bottom of which we will have the silhouettes of two soldiers with heads bowed. Inside the church there will be a Poppy display made by the people of Town Thorns who are severely disabled. On Saturday October 20th at 11a.m. we are having a short service outside the church to ‘unveil’ the cascade. This will be followed by tea and coffee in the church. We are having a Film Night in the Community Hall on Monday November 5th at 19.30 when we will be showing ‘Testament to Youth’ the film based on Vera Britain’s book. On Sunday November 11th we will have the Remembrance Service 10.30 at the church, parading down to the Memorial for 2 minutes silence, roll of honour and the laying of the wreaths. The URC have kindly said we can have tea/coffee there afterwards. At 19.00. on the 11th there will be the lighting of the beacon on the Tump and at 19.05 the Bell ringers of the village have agreed to ring for 5 minutes to note that ‘The Battle is Over’. This will be followed by Soup and Rolls made and sold by the Scouts. For further information phone Jeanette 01788 833288.